BLUE BEETLE B.C. : Blue Beetle on the air. Episodes 01 and 02. 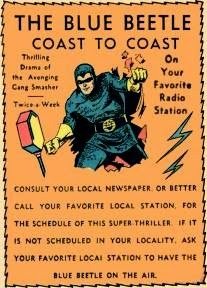 Beginning in May 1940 the Blue Beetle went on the airwaves for his radio program. Well acted, violent, great sound effects, but sadly the momentum just couldn't be sustained, and the show was pulled just four months later at the end of September. The program is where we first learn of Dr Franz's "vitamin 2x" formula which gives BB his extra-normal strength (as heard in the opening minutes of the first story). The comics would by-pass this origin story, assuming that readers were tuning in, but would briefly mention it in the opening splash panels of each story. As the program unfolds, more characters will come and go, and added into the comics as regulars. Here we have the first two stories, with the first one opening up with a bang, involving a subject that wasn't dealt with too often at the time: drug dealing.